Radioshack-Leopard achieved a solid set of results on stage five of the Santos Tour Down Under in Australia on Saturday, sending Ben Hermans into third overall, a podium spot he is likely to wrap up after Sunday’s criterium around Adelaide. Tiago Machado (pictured) was ultra-aggressive on the final ascent of Old Willunga Hill, finishing fifth on the stage and locking down sixth place overall. The squad used a team effort to set up their finish. 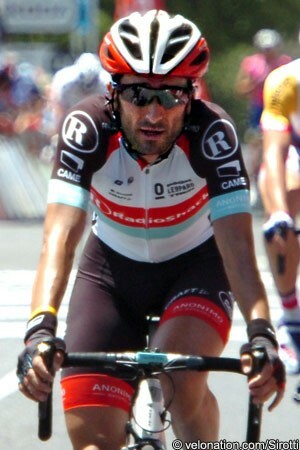 Laurent Didier spent part of the day on the front of the peloton over the flats. Approaching the bottom of Willunga Hill, the 3km drag that has often decided the overall general classification, it was Radioshack-Leopard driving the tempo, with Jens Voigt at the wheel. Team rider George Bennett was one of the first to stick his nose in the considerable wind, trying apparently to set up Machado. The Portuguese rider was one of the strongest on the day, but he could not match the strength of stage winner Simon Gerrans (Orica-GreenEdge) or new overall leader Tom Jelte Slagter (Blanco). But their efforts were enough to put Radioshack-Leopard at the top of the teams classification, where they sit 1’28” ahead of Movistar with a stage left. Despite this and a likely final podium spot for Hermans in Adelaide, the team’s leading trio left Old Willunga Hill wanting more. Bennett rode to 19th on stage five, 32 seconds behind Gerrans. The New Zealander now sits 13th overall, 48 seconds slower than Slagter. The 22-year-old offered his assessment of the stage. Judging from comments by Hermans, plan A for Radioshack-Leopard was Machado, who put in an extended effort to get away near the beginning of the final Willunga ascent. He was looking to make up 15 seconds on leader Geraint Thomas (Sky Procycling), and would have ended up needing the stage win and ten-second bonus to have any chance of passing Slagter. Machado’s attack was not a solo effort however, as his move also drew out Ivan Santaromita (BMC Racing) and Peter Velits (Omega Pharma-Quick Step). It was a powerful trio that rode aggressively, but was never able to achieve more than a handful of seconds on the peloton, which was being handled by Edvald Boasson Hagen and Team Sky. Hermans gets one of his best career placings in a major race, but echoed the sentiment of Bennett in regards to his team’s charge on Old Willunga. Stage six brings a 90km race around Adelaide, and since Radioshack-Leopard does not have a true sprinter at the race, the stage seems tailor-made for a breakaway by Voigt.